Lucky Link Beats is a DJ-themed video slot from Bally. And by DJ we mean nightclub superstar rather than Smashy and Nicey. It’s a 5 reel, 50 payline game that comes with a bonus round where you’ll have the pick of a selection of free spin and wild multiplier combinations. More cash and potential jackpot prizes are on offer in the unusual Lucky Link feature. Play on your desktop tablet or mobile from between 50p and £100 per spin. The visuals in Lucky Link Beats are rather well done. In the background you’ll see the waving hands of the crowd as well as thumping speaker. The reels feature neon ace, diamond, club and spade symbols as well as a mixing deck, microphones, spotlights and vinyl records. The headphones are the most rewarding standard symbol, paying 0.5, 2 or 5 times your bet if you land 3, 4 or 5 in combination. Better still is the Lucky Link Logo which is the wild. It replaces everything bar the 2 scatters and awards 10 times your bet if you land 5 on a payline. 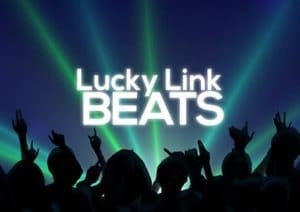 There are 2 bonus features on offer in Lucky Link Beats. Lucky Link feature – to trigger the second bonus round, you’ll need to land 4 of the musical note scatters on the same spin. On offer here are 3 free spins with the musical note scatters from the triggering spin locking in place. There are no paylines in play here. Each reel spins on its own. If you land a musical note scatter it too locks and the free spins reset to 3. Landing enough musical notes and you’ll open up extra rows. Get the maximum and you’ll be playing on an 8-row machine. Each note symbol comes with a cash value attached. These are all added together once your spins are over. You could also win 1 of 4 potential fixed jackpot prizes here. Visually, Lucky Link Beats is rather well done. Given the DJ and dance music theme you’d have thought that Bally would have invested in a decent soundtrack rather than the weedy offering here. That’s a shame as there’s plenty to like about Lucky Link Beats. Free spins and wild multipliers are always and good combination and the Lucky Link Bonus offers something a little different. We enjoyed Lucky Link Beats. It’s really close to being a banger but just falls slightly short. It’s still worth investigating though, especially if you like your music with plenty of repetitive beats. I would personally opt for Playtech’s Wild Beats though.